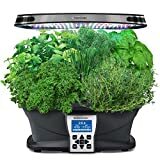 AeroGarden Products are Deeply Discounted Today! Not only do these little wonders grow herbs inside your home, they do it with very little input from you as a human. Your job is mostly to harvest herbs precisely as your recipes call for them.